Microsoft today announced an imaginative new all-in-one PC for design and creative professionals, the Surface Studio. This new ultra-premium device combines incredibly powerful hardware with specific optimisations in Windows 10 in a stunning metal body. One of its most notable features is a new peripheral, the Surface Dial, which gives Surface Pen users a way to manipulate their tools and workspace intuitively using their non-dominant hand. The Surface Studio will cost $2,999 (approximately Rs. 2,00,450 before taxes and duties) and will be available in limited quantities this holiday season. The device is designed to put software front and centre, making the hardware disappear. It has a fixed base and a 12.5mm thick screen which floats above it on two arms. Users can get as close as they like, even tilting the screen downwards at a 20-degree angle like a drafting table and leaning on it with their arms. The screen can stay put at any angle, thanks to custom-engineered arms which each contain 80 parts including springs and counterbalances. The 28-inch screen uses an atypical 3:2 aspect ratio with a resolution of 4500:3000, which Microsoft's head of Windows hardware Panos Panay emphasised is 63 percent higher than 4K. It can display the full DCI-P3 colour space - and users can switch between that and Adobe sRGB on the fly using a control in the Windows 10 Action Center sidebar, to preview content as most others will see it. Scaling is set to 192ppi which mean that objects such as a double-spread page layout can be displayed at a perfect 1:1 ratio compared to its physical form. Panay also stated that Microsoft had engineered the LCD panel to be the thinnest ever, at 1.3mm. That involved developing new backlight and polariser technology, amongst other things. The unit's 270W power supply is built into its base, so only a single cord is absolutely necessary. Cooling is handled by three fans which are interlinked so they can adjust smartly. Microsoft didn't divulge much about specific hardware or possible variants at the event, though according to its website, the CPU options are Intel's Core i7 and i5, there's an Nvidia GeForce GTX 965M or 980M GPU, up to 32GB of RAM, and a 1TB or 2TB hybrid SSD (promotional imagery at the event showed a PCIe M.2 SSD). There's also a 2.1 speaker system in the base, integrated Xbox wireless controller support, high-quality front and rear cameras, plus a mic array for Skype. There are four USB 3.0 ports, an SD card reader, a headset jack, and Gigabit Ethernet port as well. Multiple demonstrations showed the Surface Pen being used to mark and edit Word documents as well as sketch and colour in Photoshop and other creative tools with little to no latency. More interesting though is the new Surface Dial, a wireless puck-shaped accessory which looks similar to the Griffin Powermate but has adds whole new dimension to human-PC interaction. It runs on two AAA batteries and uses low-energy Bluetooth. 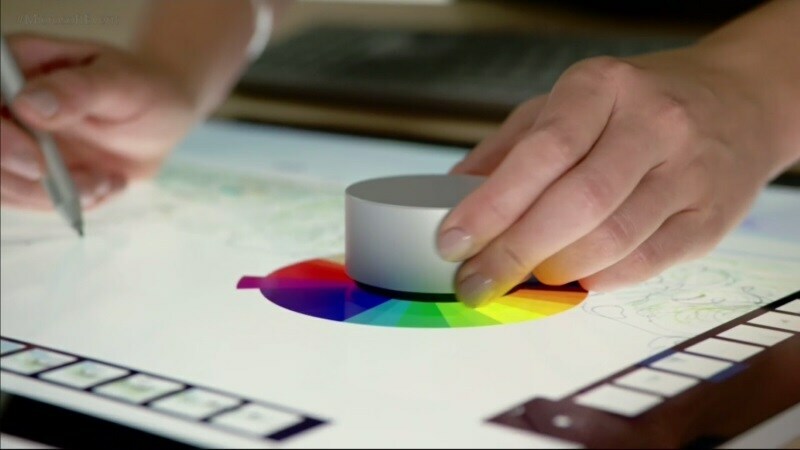 The Surface Dial can be left on a desk, tapped and rotated, and menus will appear on screen telling you what it is controlling - for example scrubbing a timeline or zooming in and out. However, it can also be placed against a Surface's screen, where supported software can draw a palette or toolbox around it. Users can then tweak tool attributes, colours, or any of a vareity of parameters while actively using the Pen in their other hand. This allows for extremely subtle colour blending or other kinds of manipulation. According to Microsoft's website, the Surface Dial will work with not only the Surface Studio but also all Surface Book models and the Surface 3 and 4 Pro, though on-screen features are limited to the new AIO device. The dial is priced at $99 but is included with every Surface Studio. 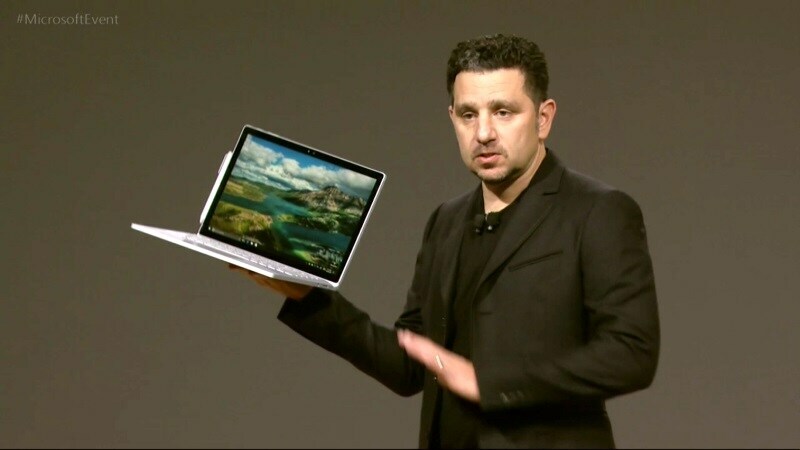 Panay also announced a more powerful Surface Book variant with 2x the graphics processing power, up to 16 hours of battery life, and an all-new interior architecture with improved "hyperbolic" heatsinks, all within the same body as existing models. The new model is priced at $2399 (approximately Rs. 1,60,345) and will be available for preorders in the US now, with availability in November. No details about global availability for any of the hardware announced today is available yet.